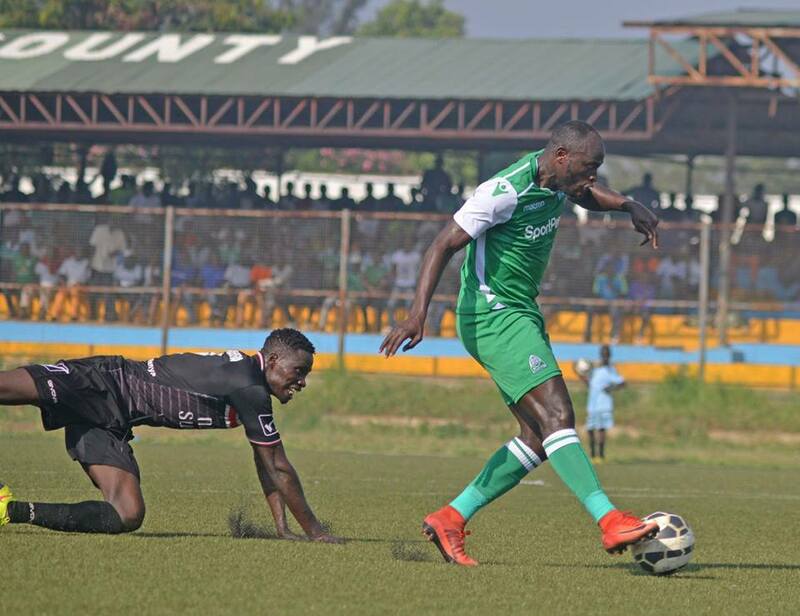 Speaking after the dramatic 3-2 win over SoNy Sugar, Gor Mahia coach Hassan Oktay praised his side for twice coming from behind to win a difficult match. Oktay says it is because he has instilled patience in his team. Thus the team does not panic when down. “As a team, we’ve learnt to be patient and fight to the last minute of any game. That was our weapon,” he said, adding that,”. Oktay also said the ability to rotate players and play them out of position has helped reduce fatigue. Dennis Oliech for his part is adamant that Gor Mahia must make use of home field advantage in order to enhance their chances of advancing. “It is a tough game but we need to ensure we finish the job in the first leg. We need to win and win by a big margin to make the return tie easier for us,” Oliech said to CAF online. Oliech is also hungry for a title which he has not won in a long time. “My focus now is on helping Gor Mahia win the league. Personally, I want to win a trophy because it has been so long since that happened. The last time I won a title was in 2010 when we won the CECAFA Senior Challenge Cup in Mwanza with Harambee Stars. I want that feeling all over again,” Oliech said. Oliech is still focused on his target of scoring 25 goals which he set for himself at the start of the season. “I know I can do it because if you play in a team with good supply, finishing is never a problem,” the forward further stated. His other stated goal was to play in AFCON 2019. He has however chosen not to focus on that goal now. “But at the moment, I am not thinking about AFCON or getting into the team. First, I want to do well for my club and help us achieve the goals that we want to earn especially winning the league,” the forward stated. Aside from scoring, Oliech has been a perfect example for younger players to follow. Coach Zico: We win in difficult conditions. Assistant coach Zedekiah Otieno has lauded the team for winning matches despite a crowded schedule that left little time for training. “It’s not easy what this players have done winning under extremely difficult circumstances, barely training. They know what they will achieve will be historic and they have remained focused. We are happy now but we focus on the next game. We are Gor we set standards,” said assistant coach Zedekiah Otieno. Former Gor Mahia skipper Jerim Onyango is proud that his former side has scaled to much greater heights than it did during his time. Jerry “Jagoal” as he was popularly known, joined Kogalo when the club was a mid-table team. His moment of glory came in 2014 when he saved a penalty in regulation time and two penalties during the shootout to lift Kogalo past US Bitam. Jerim re-iterated the importance of a home win due to the difficulty of winning away from home. Despite playing without several key players, Jerim believes that those given a chance will acquit themselves well. “On suspension, I feel that can be a blessing in disguise because the players who will play instead, can grab the opportunity and show what they can offer,” he said. While Gor Mahia have gone on a winning spree, their Moroccan opponents have been sub par in the Moroccan league. They are in 9th place. Their last match was a 1-1 draw against 10th placed Khouribiga. That was on April 1. They have had several matches postponed. Prior to that, they lost 1-0 to 4th placed Hassania Agadir on March 17. However they will be encouraged by trhe fact that their continental form has been a lot better than their domestic form. The Arabs are here already. The North African team led by coach Mounir Jaouani secretly landed in Nairobi on Wednesday afternoon and checked in at the Raddison Blue hotel in Upper Hill in readiness for the contest. Otkay, I have a problem with dominant Gor. You can say anything everything everywhere and it cannot be challenged. Lucky you. You look Good because other teams are Bad enough in the local league. What is in your mind? @Omollo, In my mind? We must ensure Otkay does not become complacent and make pronouncements reminiscent of a local coach. The local scene cannot be his benchmark. That’s lowering the bar for Gor Mahia. He must appreciate Gor has dominated local scene for decades. He must ensure the belief he has installed enable us dominate Africa. Local league does not excite anymore unless we are walloped by a small team. waiting to see him on the terrace and players in the pitch – he has installed fighting spirit so the player should prevail. @OJOmondi, very misplaced posting and comments indeed. We know the hatred and Jakoyo have for our coach. There are many clubs in Kenya where you can migrate to if you are not happy with coach Oktay who has been right and is here to stay. You guys and your ilks have been wishing the coach to loss but it won’t happen. Come slowly @OJomondi. Oktay is the most underrated coach by majority of fan, but trust me, he is taking this team farther than any other good coach has done. In Oktay I trust. The Moroccans are going down 4 -1 at Kichinjio – Kasarani. The only road block is in the Semis. Am not worried even with the absence of some players because any player given chance will perform. It will be like 1987 if am not wrong when 9 players were suspended but those who were given the carried the day. Thats when the Obwaka’s became hero’s so tomorow we are waiting to crown new heros. All the best boys and fans tujaze stadium am already on my way from Lodwar hoping my by tomorow morning I’ll be in Nairobi to cheer th team on. @OJomondi..let’s not forget that we have lost three games so far.by branding other teams as bad it means that there is literally no competition for Gor.it’s not like we are running all over teams.it’s by sheer sweat and hard work that we are carrying the day and that is why the margins are so thin.let us not get to carried away and forget that there is still a long way to go and we are not yet in a position where we can categorically say that we have achieved. @Jakoyo get lost as your hatred for Oktay is well known and documented here. Why can’t you look for your favourite coach a team to coach as there are no coaching vacancies in Gor Mahia at the moment. spot on @ojomondi. Oktay parrots too often forgetting he will be judged by the number of trophies won.So far, zero trophies WON………offcouse, the league could have been won by any local coach.so what makes him special ? @Jakoyo and your rudimentary ilks get lost as your hatred for Coach Oktay is well known and documented here. Why can’t you look for a team that your favourite to coach as there are no coaching vacancies in Gor Mahia at the moment. Coach Oktay Manwar Wuoyi Siro aka Mourinho is taking K’Ogalo to greater heights unscaled before in club history. Why are some bloggers negative even in the face of good results both locally and continentally? Is it that your penchant for doom was so great you are now openly criticizing a coach for winning too much? Well Oktay will have two trophies by seasons end the first double since Nuttal era. Support our Diehard Coach who envisions the true spirit of Mayienga taking No Casualties along the way…Munataka nini ndio mufurahi jameni? @Ojomondi, your observation is very interesting regarding Oktay, Gor and other kpl teams with performance. In one of my comments just recently, I talked about the benefit of playing in the Continental matches. It gives you the advantage of coming up against teams that are established. This is what Gor is reaping from. From the time we broke the domestic barriers and also roped in on the International Coaches, truth be told, our team has cultivated a different mind set. For example, Oktay talks about “instilling patience and a fighting spirit” a few times while playing, Gor has come from behind to beat teams. In the very Epl that we follow, there was the famous ” Fergie time” You fight to the end. This takes technical know how and application in the real situation. As much as it is true that the league is young, when Gor involved internationally and lagged behind in matches, Kpl teams suddenly just stagnated, they could not pull away from each other thus the closeness in league standing. Gor comes back and suddenly is so many points ahead. This is happening because Gor is playing in two leagues, Local and Continental. Let’s give credit where it is due.oktay started badly but has somehow steadied the ship with some good results. Even if the coach was going to be Ferguson,it would still have taken him time to settle. As fans let’s play out part and leave the TB to do theirs.it’s healthy to debate and critique here and there,but if the team is doing well let’s carry that positive vibe and encourage them further. I think most of us here are for the good of the club…so let’s go out there in numbers and spur them to victory on Sunday!! A big applause and standing ovation for coach oktay.You have really brought stability in gor.I know the immediate former coach fighting relegation down south is now very bitter and envious. Continue with your good work Oktay we are happy with you. I hope we gathered some intelligence on this RS Berkane as part of our preparations. The striking thing about this team is their contrasting performance in the domestic and continental fronts. We need to understand that their stellar continental record is founded on sly business mindset. If the continental games are more lucrative than the local league then a sly businessman will work out ways of entering the money phase of the continental games and staying there for as long as possible. So what did they do? Simple: play the second string in the domestic league and set aside the best outfit for the continental matches. This way the first choice team will always be well-rested for any continental duty. The weaker second string is lying 9th in their league while cream of the team is doing well in Africa, home and away. We should therefore expect to play against fresh pairs of legs on very fit players. Let our boys raise our game and balance the output throughout the 98 minutes..
Any indepth look at coach oktay will show that we must appreciate that this guy has taken us this far amidst very very difficult circumstances. This is a guy who came into a team that had been formed with no input from him , thrown immediately into the deep end with helter skelter matches , left , right and centre both in and out of the country , leaving him with little or no time to impart his phylosophy , if any , on the team . Secondly , when we criticise the coach for losing all his away matches , let us remember that all those teams we have lost to away , have equally all lost their away matches to us . @OjOmondi may have been on to a valid point (may) , but its unfortunate that as predicted , the usual opportunist has opportunistically decide to ride on his remarks to throw belittling broadsides at Oktay , not because he has any issues with Oktay , but rather to continue pursuing an agenda that has since increasingly become stale , desperate and unsellable . I have said this before and I will repeat , Anybody who understands football beyond the emotions , will for the moment not have a cast in stone opinion about Oktay , funnily enough , we seem very understanding when it comes to our favourite teams in Europe/England , where you will hear a lot of , lets give Pep some more time to impart his phylosophy (2-3yrs ), lets give Klopp a bit of time , or Emery , its only teams e.g Chelsea that have no history or tradition going beyond one generation of Abramovic that you find similar emotional turbulence that you see in sections of irrelevantly high volume Gor Mahia non technical fans . So yes , I appreciate Oktay to this extent , but unfortunately am of the era that grew at the time when there was no difference in the way Gor used to play and the way Barcelona play now , and as such pleasing/entertaining some of us is not easy , na sio kwa ubaya , I hope that day comes . I will finish by asking/requesting/demanding that we fill that stadium to the rafters this Sunday and why not , I will be there , Will you ? I used to think that Rocket Science is the only thing that is most difficult to understand. But now I have come across another thing which is even more difficult to understand……the fact that some fans here just can’t even give Oktay some little encouragement even if they don’t want to praise him! I think its just right to CONGRATULATE the EC that we are onto a Friday Evening , two days into a big game and we are yet to hear any bad news from the ever sniffing media about Go Slows , Oliech’s threats , Players locked out by Landlords and snubbed by Girlfriends . Somewhere at some dingy mogoka joint in Jericho , JUDITH ANYANGO AKA NYANGI is going crazy at the lack of materials to work with and the journalists are under pressure to get or manufacture a Kogallo headline . Finally I thought it wise to remind the weak kneed amongst us that from all the teams we have played against to date I.e Zemalek , Hussein dey or Athletico petro , RS Berkane is the least threatening or in plain language , The Most Useless , This is a msg targetted at the people here who may be suffering from some heart ailments or ulcers and only attend matches they are 100% guaranteed of winning , am guaranteeing you this one , Please come . My special plea to Geoffrey Ochieng , Young man , opportunities come to people in a variety of ways , your opportunity at the international stage has come courtesy of Batambuze’s foolish red card and it guarantees you at a bare minimum 2international games and am one of the many or few who believe that you are our future at that position , all you have to do is proove as right now that the opportunity has come and if you do , I can say without a shadow of a doubt that this will just but be a start to your innaugral stint in the bigger leagues in Europe . Dear Geoffrey , Gor fans are very very appreciative of those who show appreciation for their badge and who give their all or die trying when an opportunity such as this Sundays’ knocks BUT if your performance is to the contrary , then you may not believe those are the same guys you saw cheering a while before . Mr. Geoffrey , Gor is a high pressure club unlike wherever you were signed from and so cometh the day , you must be psychologically , mentally and phisically prepared . Go Go Geoffrey and Super glue that left wingback position. CC: To anybody who personally knows Geoffrey in a sporting way . @Jasego , I am made to understand that CS Amina Muhammed will be one of the special guests in the Gor -Berkane game , my question is @Jasego , Will Amina Muhammed go into the pitch and GREET the Gor Players . Those with an institutional memory of Team Gor Mahia understand the context of my question , if you dont , then it means that you are yet to be seized on the spirits of Mahia . You see being a Gor Mahia fan like I see with a lot of fans who come to support Gor coz its fashionable , is more than just turning up and turning on the volume , being seized of Kogallo spirits involves going through a complete metamorphosis once you enter that stadium , it involves being totally unfamiliar with yourself and what becomes of you , you may be a top engineer , top lawyer , former Prime Minister , future President , but there will be no difference between all of the above and a Makanga /hawker/pickpocket or thief when the spirits of Mahia seizes you , in other words it makes us all equal and extremely and unreasonably partisan with all that is in front of us . one day is a lawyer . To those slow to understand the innerworking of spirits , I will elaborate with one example , Have you ever seen those Dini ya Musambwa guys or their equivalents , some men or women , 70yrs and above , Running to and fro while ferociously hitting the drums and covering a distance equivalent to Kibera-Kasarani nonstop and in record time , well , that is not energy , it is being seized of a spirit . Now back to Gor Mahia and our spirits , their are spirits that “climb”a real Kogallo fan when a kogallo game is approaching , to an extent where Kasarani becomes “not far ” , if you find Kasarani far , then you are a fake Gor fan and you should go for non spiritual clubs like Tusker , Ulinzi or Bandari or Mt Kenya , being a Gor or Afc fan is a calling and cannot be faked . So @Jasego , Will Amina greet us/shake our hands ? @Teddy sofaset branch Entebbe, i think we have moved beyond the superstitions that used to be there in those early days.I used to see even skimpily dressed ladies being denied their ‘peace’ in the stadium, while gentlemen with neck ties were harassed to remove the ties, ladies could never be club officials etc. The late Grace Ogot never used to ‘greet’ the players because at that time even our medical ‘Doctor’ was Ochido Kamkunji. Every time Gor pulls those stunts like not using the dressing room, or official gate to enter the field we end up losing. It happened at Mbaraki and even Dar during the Super Cup. So let us believe in the better preps for the team and we will get far. Afterall we have some of the best players locally. The boycott thing is not true. Yesterday I saw every one training and those who are available for selection eagerly waiting for the day. Unless it’s happening today Saturday, which I highly doubt if that can happen just because bonuses. It is said that they boycotted this morning’s training. Likewise, I strongly pray that it is not true. However, if it is true that players boycotted training even after they were paid their whole March salary yesterday; if is true they went ahead and did this despite assurance from Ronald Ngala that allowances would be paid today; if it is true that they are doing this at the behest and incitement of one damsel who has lost her mental faculties because the muguka she chewed underwent fermentation after staying overnight in her bloodstream; if it is true that they chosen to trust this mentally suffocated damsel despite the obvious evidence that she is working at cross purposes with the rest of the EC and Tech Bench, then my recommendation is that they should turn out for tomorrow’s match, lose to Arabs heavily and bow out of the competition so that we can have some peace in Gor Mahia. We have had enough of this boycotts and blackmail. We have had enough of this directionless damsel controlling the playing unit. On the other hand our EC also appear to be slow learners. The acts of sabotage, attempted sabotage and insurbordination meted on the club by this individual have become too frequent and predictable. The EC should have learnt to change its way of doing things so as to deny any opportunity. Effective communication with the players and prompt payment of dues is what is required to derail the plans of any agent of confusion. *so as to deny her any opportunity to further her mission of sabotage and insurbordination. The go-slow reports are very true. The players after training yesterday refused to go into residential camp at Kasarani Sportsview Hotel opting to go home despite having been paid their March Salaries in full. They are protesting delayed unfulfilled clearance of winning allowances amounting to 120k. They also missed the scheduled morning training session today. We are frantically trying to resolve the situation though it comes a very bad time for tomorrow’s crucial encounter. After that confirmation of that Go Slow , I hereby cancel my trip neither will I watch it on TV becoz I cant plan for a trip with a gun on my head . Whatever happens in between now and then , if these players turn up and lose the game tomorrow , then there are lessons they will learn after the game and it wont be pleasant . Its becoming clear that Gor cannot afford your sheninigans , so just do everyone a favour , hand in your resignations and go to those clubs that will play both your salaries and bonuses on time -NONSENSE . Even the Goverment of China has debts , Even me am owed and I owe , but I still deal with people I owe and who owe me . You just dont destroy the little you have , including destroying yourself to proove how tough you are -NONSENSE . Come tomorrow and you will realise what an irreversible BS you have brought about yourself . I dare the players not to turn up for tomorrows game if their allowances are not settled , dont waste peoples time coming to watch you losing a game that was all along winnable-NONSENSE . Teddy weche Tek kaaa, mmm adier lit, infact ochopo sama Koro nyaka team ochungi GI both the playing unit and tb, kendo gi rachungi manyangafu… okochuno ni nyaka wabedgi some players however much they’re ‘good’ loga nochungogi what were the results… a good team that gave results…. Captain waani osina kabisa I don’t fear to say that wenye wanagoma ndo underperformers kwa team they ride on others effort mmmm nkt ,,, I admire and bemoan a Jerry like capu ama musa…. led by example…. jasego kindly consider this kwa tb wawe dropped ama wauzwe throw away price…. nyaka gingee ni gor itaendelea wawe wasiwe…. enough is enough… kokwatang tokata league dekbawa….. wiwa pok owil 2016 gima nee gatuso otimonwa bang ka aucho nodhi….. Wich ainagii ematuroo team… gidhii kwani iko Nini gor pod borecruit makawleague alaaa… wanyonyi timona GI masika kanokelo wigii negidhiii where are they??? tend miluya osina kabisa…. it’s high time……..
watch the unfolding consequences of their brainlessness . It would be shallow to even assume that the amounts that we lose are limited to the amounts fined , the truth is that there are thousands of Gor fans and their families who avoid coming to the stadium bcoz od such sheninigans . Now the hooligans are quiet , waiting to go underpay to enter , denying us revenue and then going to once again cause further hooliganism . After several calls by EC to each player personally i can confirm the boycott threat has OFFICIALLY been thwarted. EC has given assurance by monday the issue of bonus will be sorted. All players are NOW excited, rearing to go and eager for tomorrow’s match. Me I suggest That this boycott should be after every continental match win.This will make fans be on their side. Ie a go slow after Zamalek or Petro win. This idea is to the fact that our management methods doesn’t change and fans can help when they see performers suffering.